Making Wishes or Developing Goals? It’s all connected. Please note: Some of the links in this post are affiliate links. That means if you click through my link and purchase something I get paid a small percentage. It does not change your purchase price. You may read my disclosure policy. Thank you for supporting my brainstorms! First! It is absolutely okay to dream and wish and not go anywhere or change anything. Sometimes. I would even say a certain amount of dreaming and wishing without action is healthy. But if you want to go anywhere or change anything you have to act! Enjoy a few more change your life quotes by Dave Ramsey. All this to say, I’d like to share my goals for 2014. Have you made any goals yet? It’s never too late or too early. I use Dan Miller’s recommendation for seven life areas of goals, but I stretch the Career category into three categories. He recently shared thoughts on not planning out every moment of your life. I’m definitely guilty of that. -Complete Financial Peace University with my husband at least once: We’ve been following Dave Ramsey for quite a while. We’ve even listened through the CDs for the course at home, but I need some serious financial encouragement. I’m looking forward to hanging out with some like-minded couples and having the time to dream and plan with my husband on the drives to and from classes. -Organize the Budget Binder: I am typically the numbers nerd in the relationship. I will do and re-do possible budgets and scribble thoughts then present it to my husband for his thoughts before we execute, but since our newest blessing introduced herself to the world this past June I’ve been a mess with everything. It’s time to reorganize. My ultimate budget goal is to have all the bills on auto-draft and have enough cash in the checking to cover a month of expenses at all times, but that’s for another year. -Work through Anne’s Grocery Budget Toolbox: This has long been on my to-do list. We’ve been able to increase the food budget drastically in the last few years, but I still want to get the most bang for our buck. -Monthly (or more) Budget Meetings: This is another thing we’ve really slacked off about since the birth of our littlest one. It’s time to jump back on that horse! -Complete 42 Days to Fit by Brandy Ferguson, Stacy Karen, and Emma Swanston: Really I just need a jump-start plan to make exercise a part of my daily life. -Read 52 (or more) books: I read a ton of stuff, but much of my reading has turned toward blog posts. I miss reading full books, and I have around a thousand kindle books waiting on my attention as well as a bunch on bookshelves around the house. I’ll probably review some here. -Work through How to Manage Your Mouth by Connie Hughes: I want to be that mom who almost never raises her voice. I want to be that woman who never speaks unkindly to or about others. I might need to work through this more than once. -Monthly (or more) family outings: I say outings, but what I really mean is deliberate family time making memories. We don’t have to go anywhere or spend anything. -Monthly (or more) date nights: This also doesn’t require going anywhere or spending anything. It’s all about deliberately spending time together. One of my favorite dates with my husband from our pre-marriage days is when he introduced me to fluffernutter sandwiches at a park. -Monthly (or more) family service projects: I really need to plan more how this will look, but my husband often comes up with great ideas. For instance, he suggested cleaning up a cemetery that no one maintains anymore where many of my family of the last few generations have been buried. -Memorize Ephesians: This was on my list last year, but I didn’t get past a few verses. I’m trying again. My church has been working through the book of Ephesians. You can hear those sermons for yourself. -Complete Glorious Grace: This thirteen week Bible study goes through Ephesians. -Complete Kept: This thirteen week Bible study is on I Peter. -Complete Abounding Hope: And this thirteen week Bible study focuses on hope. I received all three of these Quench Bible studies by participating in Hello Mornings. If you join the Hello Mornings challenges you get a free study each challenge that is for sale later, and you also gain an awesome community of women who will encourage you through the process of learning how to start your days with God. I love my Hello Mornings group. -Create and keep a guest book for those that visit my home during 2014: I read about this idea from The Common Room blog. I think I’ll create or find some simple printables and then bind them at the end of the year. -Monthly (or more) hospitality: Growing up I can remember frequent potlucks, being snowed in with guests, giving up my bed without a second thought, creating a baby bed out of a dresser drawer, always having food to share, and never a flinch from my parents when someone needed to stay awhile. I’m not sure how I didn’t catch those practices for my own home. I blame being too busy, but I’ve been deliberately slowing life down for a long time now. I want to build in more deliberate hospitality this year. -Declutter and Deep-Clean every room in the house: I am a pitiful housekeeper. I know that some people out there keep the house clean while juggling multiple activities, but I haven’t figured that out yet. I’m the person who tries not to apologize for the state of the house and force my guests to search out one clean corner to compliment. I do not expect every room to be clean all at the same time in order to mark off this goal. -Declutter 2,555 items: That is seven times three hundred sixty-five. I don’t expect to manage declutterring daily, but I’m shooting for an average of seven things leaving my home each day. This doesn’t include trash, but some stuff I declutter may only be worth throwing away. -Finish 2013-2014 School Year: We’re halfway through. Just keep swimming, Dory. -Begin 2014-2015 School Year: Hopefully I’ll be organized enough to share my curriculum with you including what I create. -Create Catechism Treasure Box: We were making progress at memorizing Spurgeon’s catechisms and the supporting verses, but that has fizzled out. I want to fill an index card box with these truths and create printables to share and maybe sell. I hope to have this done before next school year. -Create Tennessee Symbol Study: Our first year of homeschooling we studied Tennessee all year long and had a blast. I want to organize our study into a share-worthy unit study. -Publish 52 Blog Posts: Once upon a time on a different blog that no longer exists I published content seven days a week. I sacrificed dinner and time with family to make it happen. I was driven by the idea that if I just kept at it money would somehow appear, but I had no spare time to figure out how. I’m so glad I jumped off that hamster wheel. I’ve done lots of reading and searching and stretching since then, and I think one post a week is reasonable. I’m aiming to make an income with this blog, and the vision isn’t perfect yet but I’m chasing it thoughtfully. -Complete Blog Planning Kit: I jumped on this as soon as Kat made it available at her HowTheyBlog site. I’m aiming to actually complete it. -Complete Smart Blogging Skills: I won this years ago from Kelly McCausey, and I’m ashamed that I haven’t completed it yet. This year is the year! It’s a nine week course, but I’m giving myself permission to take most of the year because blogging is not my full-time job, and I don’t want to get back on that hamster wheel. -Complete and Sell Writer’s Planner: This product is practically finished. I used to give it away to my mailing list, but I’m going to improve it a bit and maybe sale it through Amazon Kindle. -Super DRAW Sessions 5x a Week: I’m not sure where I picked up doing DRAW sessions, but it stands for Declutter writing area, Read something, Assess what you most need to work on, and Write. The original idea gave five minutes per item because surely anyone can spare twenty minutes a day for writing. I’m insisting on fifteen minutes per item adding up to one hour. Now off to add these goals into my plans for the year! 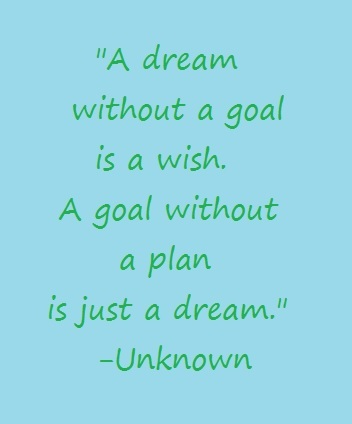 What are your current plans, goals, dreams, and wishes? The pencils were about to hit the floor again. 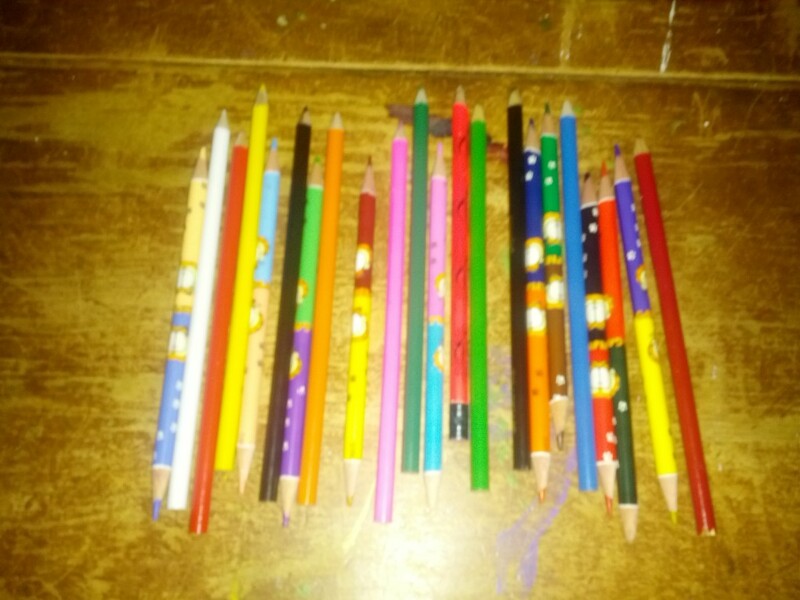 We’re a homeschooling family, and even though my husband tosses every pencil he finds left on the floor, we still have a lot of pencils because, you know, when I can’t find pencils I buy more. Because we’re just that organized around here. 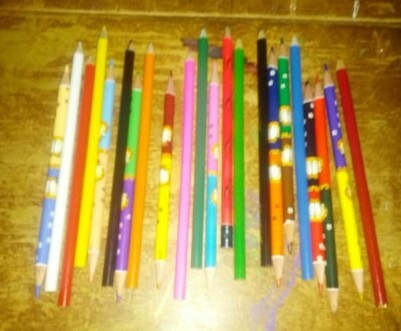 When I return I find pencils all over the floor. We have silly conversations about how Mammaw came from Blue Land and Pappaw came from Red Land (or maybe the other way around), and that’s why I explode purple. Being a mama can be fun stuff. But it can also be exhausting. So why am I writing this post at nearly one a. m.? I couldn’t sleep. My beautiful two-month old is sleeping nearly ten hours straight through the night, and I’m unable to sleep until the a. m. hours roll around. I toss and turn at night, but fall asleep nursing my baby all during the day. I met a home school mom once who trained her kids to fix her a cup of coffee every time they saw her nodding off during school lessons. I grab my phone to check Facebook one more time because staring at the glowing screen will surely help me beat this insomnia. (HA!) Then I switch to my RSS feed and the Art of Simple has shared her weekend links and did this woman just crawl inside my head? So here I am resolving once again to spend a little time each day doing something creative. Because really, I want to keep the idea of Mama exploding purple a fun joke for my children. Note: I wrote most of this post months ago. That delightful two month old is now hitting her six month mark. She’s rolling about, babbling, and offering many delightful smiles and giggles. AND still sleeping through the night most nights. (Don’t be jealous. Not all of mine have been so awesome.) My sleeping schedule is getting better, and I’m still working on working in the creative muscle usage. It’s a process. How do you exercise your creative muscles?